Ladies and gentlemen welcome to Jazz Minds Art & Café the Pacific Ocean’s jazz gem. Located in the fabulous Honolulu, it is the city’s only jazz club, where the party goes on 6 nights a week in an ultra hip setting. Combine Hawaii’s breath-taking landscapes and hospitality to fancy cocktails and explosive live music: this is Jazz Minds! Who hasn’t dreamed about Hawaii at least once in their life? Sun, palms, the local dance hula and incredible beaches. Well, today we are going to talk about Honolulu, but from a different perspective… of course, you got it right: j-a-z-z! 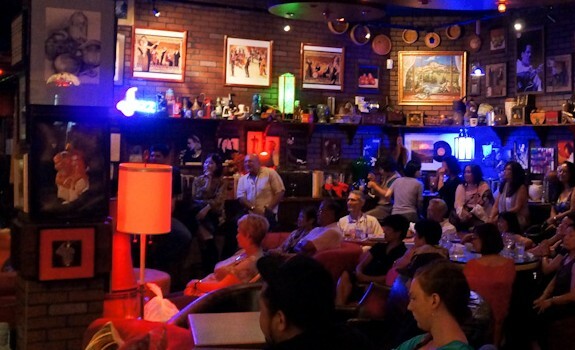 Jazz Minds Art & Café is Honolulu’s only jazz venue: an impressive design and cutting edge sound welcome partygoers to the music experience of their life. Seat back and enjoy the electrifying live acts that the club presents 6 nights a week, take a break with some of the bar’s cocktails, or why not one of the house’s special menus, like the Deep Fried Wings, Black and Blue Ahi, Hot Spicy Pupus or the Handmade Mandoo. Feeling good, ready to keep on partying? Jump on the dance floor and get ready to dance: jazz, fusion, funk swing and blues are only few of the genres ‘invading’ Jazz Minds every week. Jazz, the mystery of creation and expression, the adventure of improvisation, the depth of true art, be a part of it! Many local, North and South American musicians stop by Jazz Minds every season to give Honolulu’s nightlife the best live music around and you are very welcome to join the party! Additionally, it is possible to have birthdays, anniversaries, graduations and any type of holiday celebration right here at Jazz Minds Art & Café. The chefs can provide food (or you can bring your own) and Jazz Minds can also provide a live band, a full karaoke system, a DJ or projector. Whatever request you might have, the staff will make sure that you will be completely satisfied. Sun, incredible beaches, delicious meals, refreshing drinks and fancy cocktails and explosive live music for 6 nights a week… a dream? No, Jazz Minds!